Though most people now associate Halloween with pumpkins, it is in fact the apple that is traditionally connected with this time of year. Halloween traditionally marked the end of the apple harvest, as it was thought that any fruits which were not picked and stored by halloween night were spat on by the pooka! In fact the apple tree has long been regarded as sacred, from its appearance in the garden of Eden to the myths and legends of the Celts, and the apple itself has often been described as ‘The Food of the Gods”. As the old saying goes, “An apple a day keeps the doctor away”, and like most old sayings there is a lot of truth behind it. Apples are full of vitamins, minerals and other important nutrients, in a form that makes them easy to digest and absorb. These nutrients are essential for keeping the body healthy and helping to prevent disease. Stewed apples are an ideal source of nourishment for young children and for anyone recovering from ill health. As well as being packed full of vitamins and minerals, apples also contain antioxidants, which help to prevent premature ageing, cancer and numerous other health problems. The red-skinned varieties are generally richer in these nutrients than those with green skins. Apples also stimulate the liver to eliminate toxins from the bloodstream and they have a cleansing effect on the entire body. In particular, they help the kidneys to excrete excess uric acid, which can contribute to psoriasis, arthritis and gout. The slightly acidic taste is due to the fruit acids called malic acid and tannic acid. These stimulate the digestive system and help the body to digest protein and fats. This is one of the reasons why apples are traditionally eaten with pork. The combined action of the fruit acids and soluble fibre also helps to relieve constipation, providing a very safe and natural solution that is particularly effective in children. 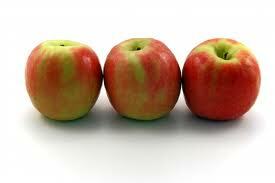 The soluble fibre in apples is found in the flesh rather than the skin and is called pectin. Pectin helps to lower cholesterol levels by reducing absorption from the digestive system. In addition, it reduces the absorption of toxic substances such as lead and pesticide residues. It also helps to balance blood sugar levels, which makes an apple an ideal mid-morning or mid-afternoon snack for people who experience sugar cravings. Apples were traditionally used to treat respiratory problems and modern research has confirmed that they possess an antiviral action, which helps to prevent colds and other respiratory infections. A study conducted a few years ago also demonstrated that eating an apple a day can significantly reduce the frequency and severity of asthma attacks.